BitNami Cloud Hosting makes it easy to install and run Drupal, Joomla!, Wordpress and dozens of other popular open source applications. In addition to facilitating the initial install, it provides automatic monitoring of your servers, one-click backup and restore and server scheduling. When creating a server you have several configurations options at the Cloud, server and application level. 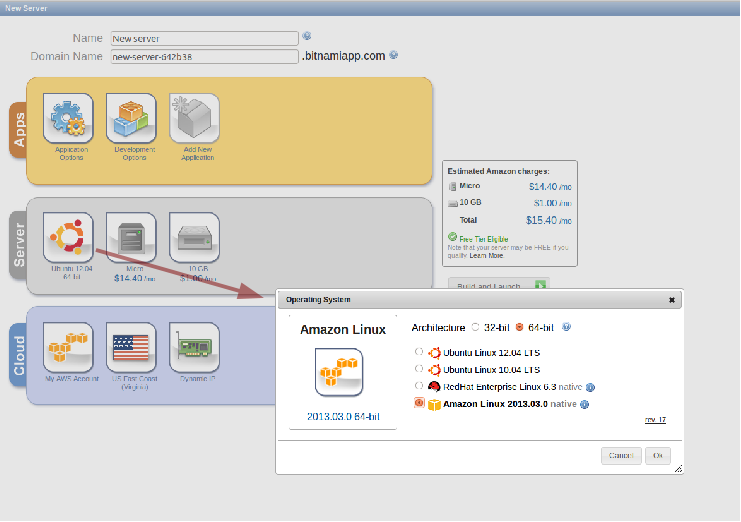 Today we want to announce that we have added support for the latest version of Amazon Linux , recently released. Amazon Linux is supported as one of the native stack options. The native stack images do not include BitNami components for the server components. Instead, we use the Red Hat and Amazon Linux native stacks (Apache web server, PHP, MySQL database etc. ), and install BitNami web applications on top of it. This allows you to use the operating system tools to keep the stack components up to date and enables you to maintain consistency across your pre-existing environments. For details about the new Amazon Linux images, please take a look at the release notes.